Further to my previous article discussing education, I am going to briefly summarise both audio courses I studied during my College education. I studied during the period of 2002-2005 and so the courses, content and tutors will have changed. This article is designed to give people interested in studying a music tech course an idea of what to expect and take away from different qualifications. I began my journey by joined the Sound Engineering course at Burton College; it took 1 year to complete and was essentially the equivalent of a GCSE. I did have the opportunity to jump straight onto the more advanced BTEC course (which I will discuss later) as I had already met the criteria (6 GCSEs at C or above and/or my AVCE in IT qualification), however as I was unfamiliar with the subject I decided to enrol on this introductory course first. The course aimed to give students an understanding of sound engineering with a heavy emphasis on practical tasks. There was a lot of hands on time with students physically hooking up and using hardware including mixing desks, outboard gear and PA systems. The course was very much self-motivated and allowed students to grab some gear and a free audio booth and get stuck in. For students such as myself who were not musicians, there was plenty to do on the technical and hardware side, from learning how to hook up gear, record musicians and learning basic processing techniques such as adding EQ and reverb. The course didn’t really focus on assignments as such, rather there would be a list of topics delivered to the students throughout the year and with each new topic students would go away and use the new techniques they had learnt. 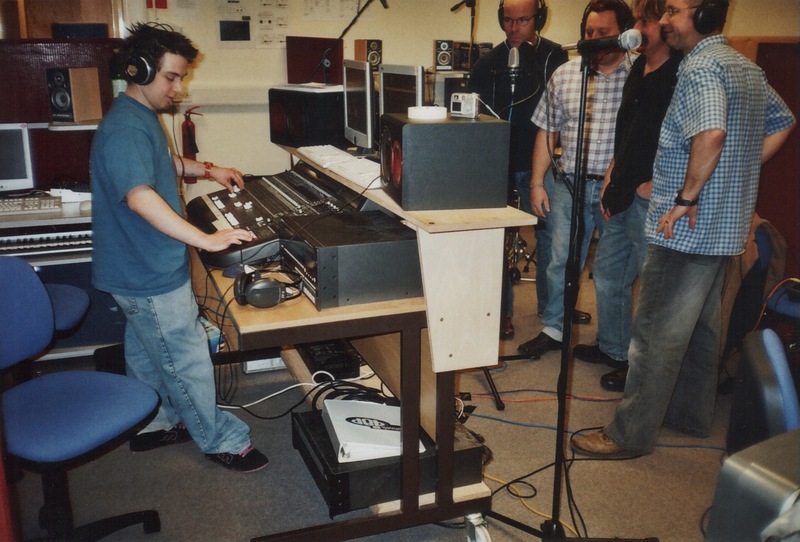 For example, one of the very first lectures taught students the basic functions of a mixing desk. Following on from this, students would work in small groups with a 4 channel mixing desk and a microphone to complete a task. The students would be asked to connect a microphone to a mixing desk, which in turn would need connecting to an amp and speakers. A minidisc recorder would be connected and students would record and play back captured audio of their choice, be it speech or an acoustic guitar. The idea behind this task was to get hands on with a small, non-intimidating mixing desk and understand the flow of the signal path. I found this hands on approach a brilliant way to get across lectures (something I felt University was missing). The other clear benefit was that students got a good idea of how virtual mixing desks and recording software / sequencing software such as Cubase handle audio and the signal path. Auxiliaries for example can be pretty difficult to explain to somebody who has never used them. Physically connecting a hardware reverb unit into an aux send, turning the aux knob on the channel of the dry signal you want to apply reverb to, then sending your reverb unit’s output into a new channel or the aux return of the mixing desk is a far easier concept to show somebody with hardware and cables rather than telling them how the software is routing the signal. Students were graded on a portfolio of work that was handed in at the end of the year (but checked by the tutor throughout the year on a regular basis). Essentially the portfolio had to cover each topic the student had studied over the course of the year. A typical entry in the portfolio might be to draw a basic channel strip, label each step in the path (Inputs, Gain, EQ, Aux, Fader, Routing switches, Pan etc…) and show how the signal path travels from the microphone to the speakers. The piece would then be accompanied by a few short paragraphs, perhaps explaining how this works to show you understand what you have done. A minidisc might also be attached in the folder containing the recording from this session. The course was marked as either a “Pass” or a “Fail”, students who passed were then encouraged to progress onto the BTEC course. The BTEC Music Technology course at Burton is directed specifically to enable students to gain experience and to prepare them for the wider industry. Rather than simply providing classroom academia the course allows for various practical elements. Ideally the course will give a student the knowledge and experience to progress onto higher education or provide a better understanding of the wider industry but not necessarily sufficient skills to progress into a working environment. The BTEC course was a lot more structured than the Level 2, with regular assignments, deadlines and more structured tasks to complete. Students on this course are primed to progress onto University so lectures are given on a more regular basis and are designed to introduce each new topic and build on the theory over several weeks. Assignments at this level have a specific list of criteria that have to be met in order to achieve one of several pass grades (fail, pass, merit or distinction). A pass would typically mean the student has a basic grasp of the topic and has handed in at least of few paragraphs with relevant information on the subject. During my time as a student I saw pass assignments handed in that contained obvious copy and paste efforts from Wikipedia, but the point was that the student actually had at least searched for and found relevant information. A distinction would generally be awarded for showing referenced research, diagrams, practical examples of how the student has applied this knowledge to their own work and appendices containing work and extra notes or findings. The written sections would generally be more extensive than “pass” assignments, showing the student has taken the information, digested it and relayed it in their own words. A distinction would be far closer to the calibre of work expected from a degree student while a pass would be more typical of the type of work that would be acceptable on the previous Level 2 course. What else can you expect from a college education? Well different Colleges will all vary in what they can offer. Some Colleges may have great tutors but poor facilities and equipment, others may have good links with the industry or organise a lot of guest lecturers and day trips. The tutors at Burton College were from a range of backgrounds and all had different skill sets. During my first year the music technology department was significantly smaller and as such there were only 2 tutors. One tutor taught music theory lessons and helped students who wanted to develop their abilities on a range of instruments. The other tutor, who was the head of the music tech department had his own studio, was an experienced sound engineer and delivered all music technology lectures. By the time I began studying on the BTEC course the department had taken on more students, tutors and updated its facilities. One of the new tutors had just graduated from University and his knowledge and technical background were a welcome addition to the college. Whereas the head of the department was a seasoned sound engineer with plenty of hands on experience with hardware, this new tutor had a great understanding of newer technologies and software. Having tutors from a range of backgrounds really helped deliver all aspects of the course. Throughout my studies other tutors would come and go, some came from University, others were session musicians, some were transferring from other colleges. Facilities at the college were second to none and improved year-on-year. There were enough computers for everybody; all featured a sound card and current versions of standard plug-ins and sequencing software. There was also a wide range of hardware from ADAT recorders, digital and analogue mixing desks, microphones and PA systems. Since leaving the college they have also replaced all PCs with iMacs and all students now have access to Pro Tools and Logic Pro. A professional recording studio was constructed a few years after I had left. Contrast this to the University of Derby, where I studied for my degree. At the time we were using software that was several years out of date and the recording studios were off limits to anybody in their first year. Students with access to recording studios had the choice of using the old studios that were becoming extremely dated or the newly built ones. The latter were not sound proofed; indeed they were standard office rooms that had thin panes of glass to divide the control rooms from the live rooms and hollow ceilings. Burton in particular has given students many opportunities over the years to interact with the wider industry. This helps prepare students for a career in the industry and introduce them to aspects of the industry that they may not have considered before. Students were given an insight into the wider industry from guest lecturers and industry insiders. One of which was a workshop on Ableton Live delivered by an employee who worked for the company. Students were given an insight into how the software works, learning tips and tricks. Students were able to get some hands on experience before taking part in a Q&A session. In recent years I myself have given several guest lectures at the college, giving students an insight into the games industry. Most students on the course set out to be sound engineers or musicians so this opens up a whole new career path to students who wouldn’t have even considered the games industry. During these lectures students are introduced to the world of game audio, shown examples of work and learn about some of the processes involved in creating audio for computer games. Students have had the opportunity to visit BBC Radio 1 and 1Xtra where they were able to speak to professionals working in the industry. Many students may not consider a job in the broadcast industry. The visit informs students of how to work their way into the industry, living costs in London and other opportunities. Music Live is a now defunct yearly event held at Birmingham’s NEC, here students have the opportunity to buy, use and get hands on experience with new equipment while meeting industry professionals from many companies. Although anybody can buy tickets for Music Live, students at Burton College are presented with a free ticket and free transport to encourage them to take part in this event and get involved with the industry. Most students probably won’t know exactly what they would like to do after graduating from college or university. I didn’t know I wanted to do audio for games until my 2nd year of university. The sound engineering and music tech courses were broad in scope rather than focusing on specifically becoming a sound engineer or musician. There can be positives and negatives to these types of courses, if you are absolutely sure you have found the right industry for you then a more specialised course might be the answer. If however, you have an interest in music technology but would like to keep your options open to game audio, location recording, broadcast or a host of other industries then these courses will give you a suitable foundation to work with but no real insight into one particular career path. When I began working in the games industry I didn’t anticipate exactly what the job role of a games audio designer would involve. I had no experience with common game audio tools and software, had I been on a specialised course I could have been introduced to these much earlier and had a few years to learn the basics.